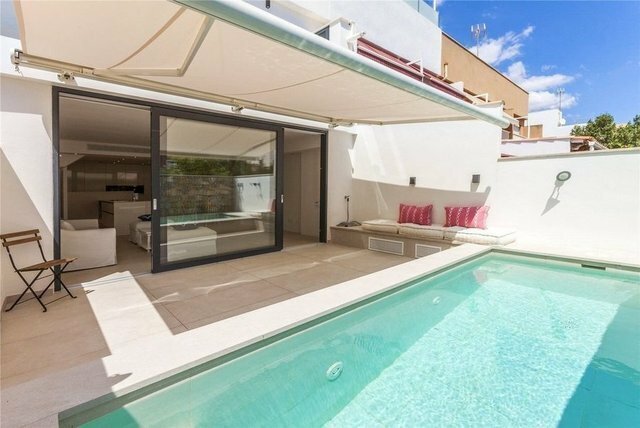 Luxurious, reformed townhouse with pool, only a few metres away from the beach in Portixol. Located in the famous area of Molinar - Portixol, and a few metres away from the gorgeous beach, this townhouse has been recently renovated with top quality materials and very good taste. The property has a built area of 325m2 and is distributed over 4 floors. We access the house either through the garage with an automatic door or the main door and after crossing the hall with a wardrobe, a couple of steps lead to a spacious living room, full of light thanks to large windows that overlook a private patio, where there is also a pool with a waterfall coming out of a beautiful stone wall. Returning to the living room, we also find the kitchen, modern design, plenty of storage space and top-of-the-range appliances. On the first floor is the main bedroom of generous dimensions, with en-suite bathroom, fitted wardrobes and large windows that give access to a balcony overlooking the pool on the ground floor. Towards the other side, there are two more double bedrooms that share another bathroom. One floor up is the roof terrace with outdoor shower, this terrace is the ideal suntrap spot to enjoy sea views and al fresco dinners. Details of quality of this house merit a special mention: LED lighting throughout the whole house creates different environments according to personal needs. Double glazed windows with shutters and blinders in all rooms. Air conditioning hot / cold throughout the house, gas central heating and electric underfloor heating.